Even as Seattle's minority population barely held over the past decade, the percentage of people of color swelled in the suburbs of South King County, where newly arriving immigrants and former Seattle residents converged to form majority populations in SeaTac, Renton, Kent and Tukwila. About seven years ago, Linh Tran and her husband began looking around for a newer, bigger place for their family. Their old house on Seattle’s Beacon Hill was becoming a money pit; cashing in would also let them ride a then-skyrocketing housing market. Linh Tran’s parents, who lived with the couple and their infant daughter, protested any move that would take them too far from their bank and their doctors, from their friends, familiar bus routes and favorite haunts in the Chinatown International District. In 2004, they bought a home on a quiet dead-end street in Tukwila — and with that move joined a wave of people of color who settled into South King County during the past decade. Census 2010 data released Wednesday show that even as the percentage of minorities in Seattle remained flat, it has exploded in the suburbs south of the city limits. The shift happened as people of color moved out of Seattle’s Central Area, Rainier Valley and Beacon Hill neighborhoods, joining immigrants relocating to the county’s southern suburbs. It has left Seattle barely more diverse than it was a decade ago, while in Kent, Renton, SeaTac and Tukwila, minorities comprise a majority of the population. Overall in South King County, the white population declined by more than 14 percent, while the number of people who identified themselves as either Asian, Hispanic, African American, Native American or belonging to two or more races increased 66 percent. Much of the change was driven by Latinos, whose population doubled, and even tripled, in some cities. “What we are seeing here is happening across the country — the suburbanization of the minority population, which also includes the suburbanization of immigration,” said Mark Ellis, a geography professor at the University of Washington. The shift began here in the 1990s and accelerated over the past decade, as ballooning real-estate values drove out families who couldn’t afford rising property taxes while allowing others to cash in. But this story of change is perhaps most evident in the cul-de-sacs and sprawling apartment complexes, in the classrooms and cookie-cutter subdivisions across South King County. New immigrants are bringing diverse culture to the once white, working-class communities, forcing city leaders and longtime residents to at once embrace and grapple with change. The Tukwila School District has been called the most diverse in the country. The cities of Kent and Renton have international festivals, and Federal Way has a celebration that is Korean-themed. Kent has initiated special swim times at its public pool for Muslim women. On Kent’s East Hill, along 104th Avenue, Punjab Sweets sits in a busy shopping strip where hand-painted signs announce a tangle of ethnic stores — clothing shops and Korean BBQ joints and places where Indian women shape customers’ eyebrows. Harpreet Gill and her parents, Iqbal and Gurmit Dha, who operate the Indian restaurant, moved here from India in 1980. Back then, if the family wanted Indian groceries, they had to travel to Vancouver, B.C., to find them, Iqbal Dha said. But these days, Canadians travel to Punjab Sweets or the family’s other restaurant in Redmond. Linh Tran, who works at the Renton offices of Asian Counseling and Referral Service, said she likes that her new neighborhood is as diverse as her old one. During the past decade, she said, three other sets of family members also moved from the city and bought nearby homes in Tukwila. They all still return to the Chinatown International District to grocery shop. And Linh Tran still takes her mother back to do her banking. “We let her walk around for a while before we pick her up,” she said. Classrooms in schools across South King County teem with a mix of cultures. In many of the area’s school districts, the numbers of minority children have long since surpassed that of white kids, and in most districts, more than 100 languages are spoken. The impact of this rapid change has upped the pressure on schools and on teachers trying to meet the needs of all their students, while mostly white city councils and government officials grapple with how to engage a changing population. Cities are seeing an increased need for interpreter services, and many leaders talk about the high costs of diversity, particularly for newly arriving refugees, who need low-income housing and other social services. SeaTac and Tukwila police together are reaching out to those in their large Somali communities to help develop mutual understanding so that people feel comfortable with something as simple as calling 911. Coming from a country with no functioning government, many are leery of authorities. In SeaTac, interim City Manager Todd Cutts said the challenge is serving the population amid county and state budget cuts. James Peyton, economic-development-programs coordinator at Highline Community College in Des Moines, said the diversity presents challenges and opportunities. Just two or three decades ago, most of these communities were predominantly white. Kent, the first outside Seattle to incorporate, in 1890, has morphed from a farming town where dairy and hops flourished to one where warehouses and distribution centers employ many of the new immigrants. Jack Becvar, Kent city historian, attended Kent Meridian High School in 1952, when “there was absolutely no diversity. One hundred and nineteen of us graduated; all white,” he said. Matthew Both, 44, is a Sudanese refugee and pastor who rents a house in Kent with his wife and seven children. He came to the United States 18 years ago, relocating to Washington from Michigan in 2008 after local South Sudanese refugees sent out an SOS for a pastor. He leads services twice a month for about 100 South Sudanese members in their native Nuer language at King of Kings Lutheran Church in Renton. His kids have become friends with those of other races in the neighborhood, he said, walking to and from the school bus together and visiting each others’ homes for birthday parties. “That’s what I like about this area,” Both said. In the past decade, large numbers of Latinos chasing construction jobs moved from Eastern Washington and settled where they could find low-cost housing, including South King County. Latinos were easily that area’s fastest-growing group, with a population that more than doubled from 10 years earlier. 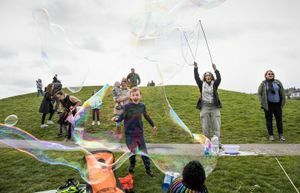 “I think the growth of the population has exceeded everyone’s wildest expectations,” said Mauricio Ayon, a Latino activist in South King County. Kent saw the launch of Washington’s first Latino-owned and managed bank, Plaza Bank, when it opened in 2006. Several years ago, Ayon did marketing work for some developers who had drawn a line on a map from the Canadian border through Washington. Using Census 2000 data, they identified Latino population clusters along the corridor, with plans to build Latino-themed shopping plazas. Before the recession sidelined the plans, they had converted an old strip mall in Kent called Midway Crossing into a Spanish-style center called La Plaza. Its anchor is The Market, half of a renovated QFC store housing eight small businesses, all owned by Latinos. Just around the corner is a shop specializing in Quinceañera, a popular Latin American celebration for 15- and 16-year-old girls. In a reflection of the area’s diversity, it’s owned by Korean Americans.